Legend Limousines Proudly offers the “Cadillac Wedding”. Our unique fleet of stretched Cadillac DTS, Escalades and beautiful 1938 & 1939 antique bridal cars allows the bride and groom to select one or a group of vehicles that will truly be distinctive. 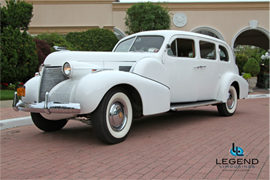 Our 1938 & 1939 V.16 Antique Cadillac Limousines are completely refurbished in 2001. These vehicles feature air conditioning and much more leg space than the traditional antique cars used for weddings. For the bride or groom looking for that touch of the old and new in one package, these antique Cadillac’s look picture perfect leading our Deville or Escalade limousines.